You may recognize Mary Risavi from her years as a friendly and knowledgeable purveyor of kohlrabi, exotic root vegetables, and specialty greens at the Heirloom Organic Gardens’ farmers market stand. 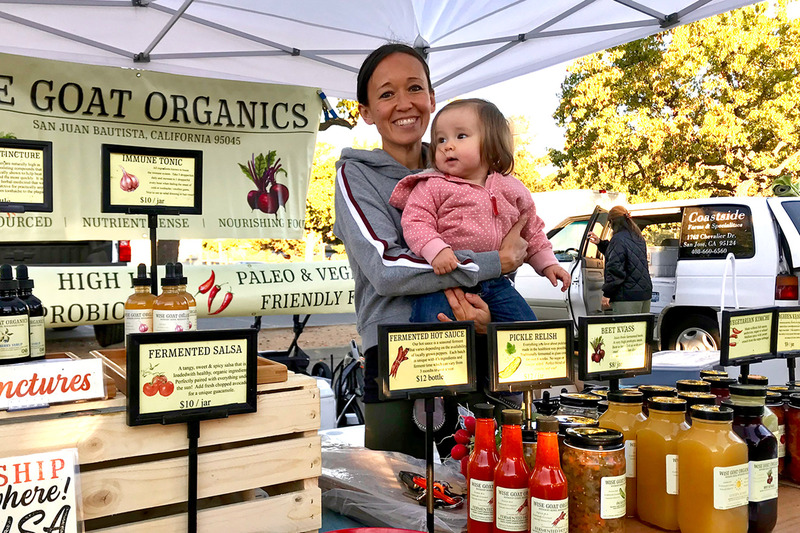 She moved on to pursue her master’s in Traditional Chinese Medicine, but she now brings her passion for local produce and nutrition back to the Ferry Plaza Farmers Market with Wise Goat Organics, a one-woman kraut business based in San Juan Bautista. 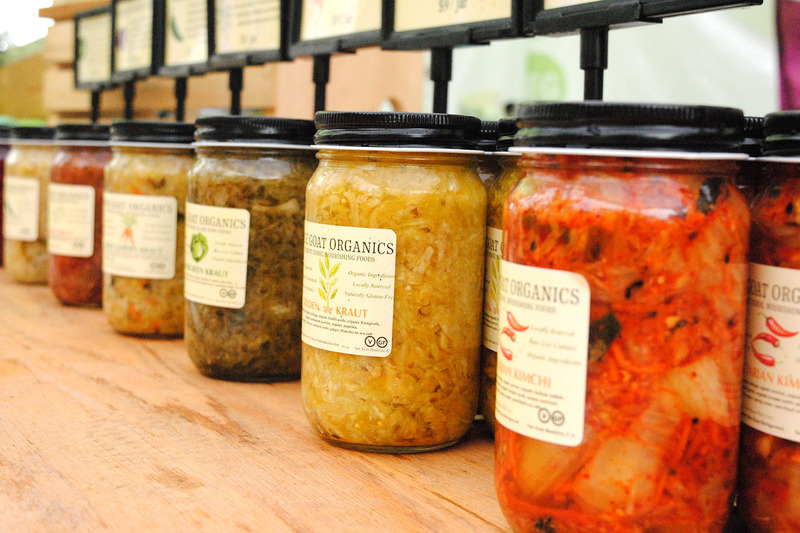 You can now find Wise Goat’s carefully made, hyper-local ferments, which range from the classic to experimental, at the farmers market on Saturdays. We spoke with Mary about the best ways to enjoy kraut, the wisdom of fermented foods, and how to stay well in the winter months. Mary Risavi: When I first moved to California, I was a natural horsemanship trainer, and I was out a horse show when I met a woman who said her husband was a farmer and he needed help at the farmers market. I had some free time, so I decide to help him out. I didn’t have a farming background or any interest in health at the time. I fell in love with farmers markets–the people selling, setting up the stand really nice, the regulars. Customers would always ask me, “How do you cook this?” “What’s the nutritional value of this?” “What’s the healthiest food you sell?” Slowly, working for his stand and selling all the amazing food that he grows and eating it, it just really sparked my interest and passion in nutrition, which led me to study to become a nutritionist. How did you studying nutrition lead you to experimenting with fermentation? Ten years ago, people were following the food pyramid, eating low-fat, and a lot of raw foods–and they weren’t getting any healthier. So when I started studying nutrition, I started finding out about healthy fats, how cooking food is important, how gluten really does hurt some people, and so on. In my practice, I realized a lot of people have digestive issues, and one of the best ways to help that is fermented foods. I started fermenting Heirloom Organic Gardens’ foods for my nutrition clients, and the demand grew from there. What was the inspiration for the name “Wise Goat”? I have some horses and goats, and I noticed that when I turn them out to pasture, the horses are usually general grazers, but the goats were really particular about what they ate. When one of them would get sick, it would eat particular parts of the tree, like the bark, or certain leaves at a certain height. They wouldn’t eat just everything. They’re really particular. I thought that would wise for humans to follow: eat according to what your body needs. What makes your ferments unique? What’s your process? I based my business on sourcing the most nutrient-dense foods I could find and preparing them properly. I love to source from local farms like Heirloom Organic Gardens, or Coke Farms, which is nearby. I do a lot of experimentation, with the colors, varieties, and what’s in season. What’s interesting is the seasonal stuff takes a couple months minimum to ferment, so you often don’t get the actual product until the produce is out of season, which is fun. When it comes to fermenting, it’s best to ferment in a vessel that’s not plastic. Most commercial fermentation businesses use plastic barrels because it’s so much easier. I do it in glass crocks with an airlock on top to make sure that they ferment anaerobically, so that there isn’t any oxygen getting into the ferment. It produces an optimal bacteria to help with digestion and other aspects of your health. It’s foods that I would eat on my own and it’s foods that I feed my baby, and I wanted to offer that for other people. What sort of questions do you get about kraut? A lot of people ask about the shelf life of kraut. If it’s a raw, live-culture food, it generally doesn’t go bad when kept in the fridge. It just continue to ferment. I have krauts in my fridge that have lasted years, and they still taste delicious. People wonder about how to eat kraut. A lot of people just eat it raw as a side or in there smoothies, but in my opinion, it’s designed to serve with something warm, like scrambled eggs or in sandwiches. My favorite is to put it on warm rice, and then some type of protein on top, like chicken or salmon. When feeding it to you kids, I always suggest chopping up really small, so you can mix it in with foods they’re eating right now. A lot of times, when kids get used to that sour flavor they love it. Do you have any tips for staying well during the winter months? I didn’t want to limit Wise Goat to sauerkraut or fermented foods, so I made an immune tincture and an elderberry syrup, which are very helpful this time of year. In Chinese medicine, during the winter months you want to have hearty foods to keep your stomach warm, like soups and porridge. It’s great to eat krauts with warm foods. Eating healthy fats–any of the saturated fats like butter or lard or ghee from good sources–is really important this time of year. Just keeping your body warm is important. Even it’s sunny and feels warm outside, it’s still energetically winter, and we’re susceptible to the environment even more. How is it for you being back in farmers markets? It means the world to me. I’m addicted to farmers markets. I really appreciate customers that go on a regular basis and support the local farmers and food purveyors. And the Ferry Plaza is the ultimate—the mecca of farmers markets—so to be able to come back around have my own thing to offer here is the best thing in the world. Find Wise Goat Organics at the Ferry Plaza Farmers Market on Saturdays. If you have questions, you can email mary@wisegoatorganics.com.